DU B.Com and B.Com (H) Admission 2018: Delhi University has announced that the University will conduct entrance examination for admission in 2 programs B.Com and B.Com (H) from the next academic session that is 2018-19. DU informed that the interested and eligible candidates who want to take admission in B. Com and B. Com (Hons) in Delhi University will have to appear for the B.Com entrance tests 2018. The university released the statement which stated that "Hereby informed to all aspirants who desire to take admission to University of Delhi B.Com/B.Com (Hons) for the session 2018-19 that the Admissions entry for the Candidates in said courses will only be made through B.Com Entrance Tests 2018." Until the academic year 2017, there were no entrance tests conducted for admissions to these courses, the admission was done on the basis of the marks obtained by the candidates in their Class 12 marks. As for now, the Admission Coordinator of the University of Delhi after consulting the college principals decided that the admission to the three years (6 Semesters) Bachelors of Commerce and Bachelor of Commerce (Hons) courses for the academic year 2018-19 will be done on the basis of the entrance exams conducted by the Delhi University itself. Dr Manoj Khanna, convenor of admission Committee of DU told last year that the entrance will be starting for the commerce admission only. But they are still exploring other possibilities in another subject. Khanna further added that they are also consulting CBSE (Central Board of Secondary Education) for Tie-up in this regard, as it conducts all India level exams. 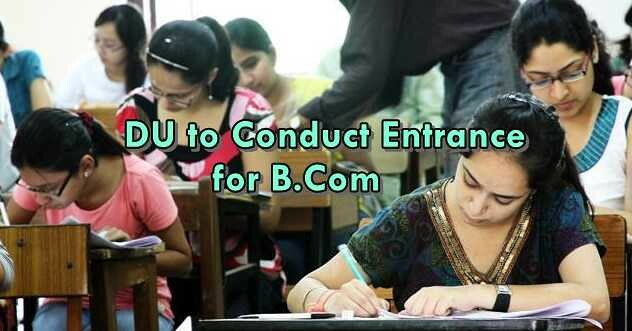 The DU authority has been working on the plan to conduct entrance examination for B.Com admission since last year, the candidates can read the news by clicking the link given below. According to the media report, University of Delhi authority is working hard to make the online examination structure and preparations a successful event and also built a student-friendly admission system. Read More Educational News Here.